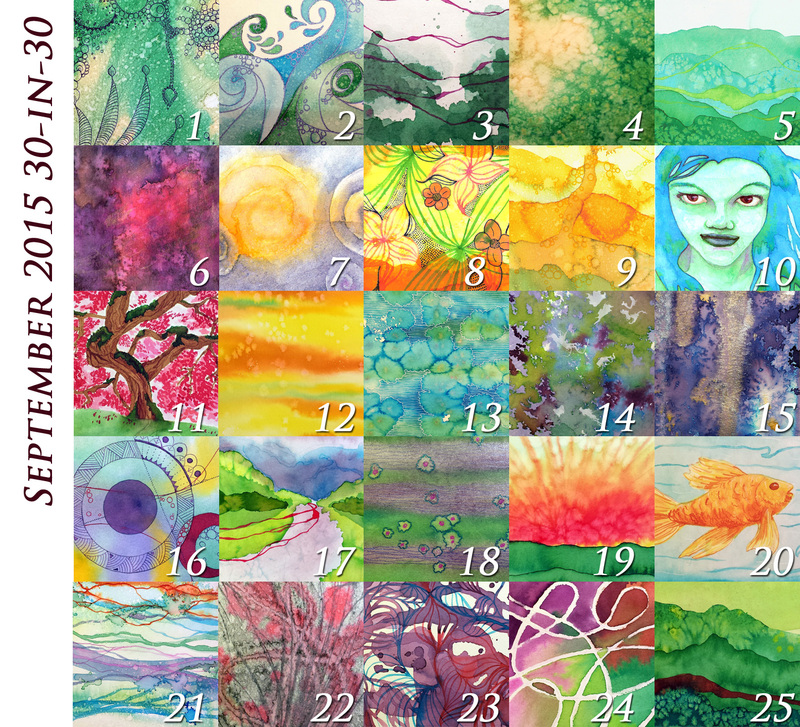 As I said yesterday, I had day 2’s painting done already, but I want to try posting these on the appropriate days. I need to get a better photo of this one, the bottom of the piece is too dark, but it’s late here and I don’t want to stay up too much longer. I did a lunchtime daily doodle for this piece and think it turned out nicely. I’d originally been planning to use white ink for the accents but the ink wasn’t cooperating and so I switched to a gel pen instead. I think I need a visit to the art store to see what other options I have for gel pens though. There’s got to be a white one available, right? 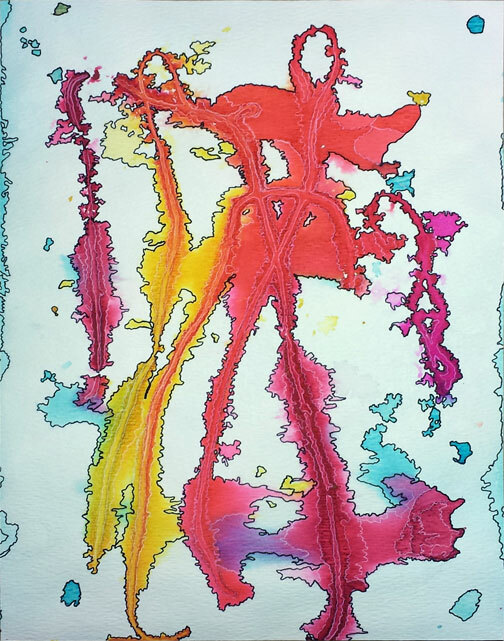 This entry was posted in Art and tagged 30-in-30, Abstract, Pen, Watercolors on September 2, 2015 by Lori. So I’m all caught up and working ahead a bit, which is a good thing. I have day 19 done and ready to be sent out (?!?) and the base for day 20 is drying on the backing as I type this. Day 19 is a two-fer piece. 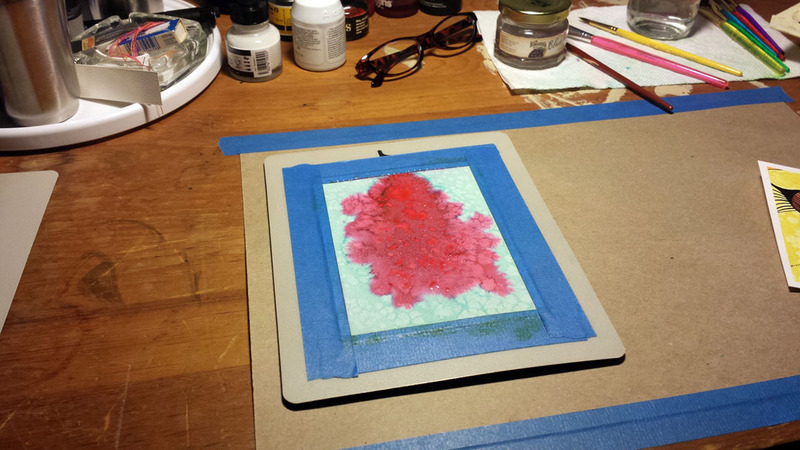 In addition to doing this painting challenge, I’m also taking part in Postcard Swap #4 organized by Dawn Diamantopoulos. I got my address to send an art postcard to and decided that I would do that this weekend and also count it for one of my daily challenge pieces. For this, I went back to my retro circles a bit, but I also used a few new things as well from this month. In the interest of staying ahead of things, I also started working on the base for day 20’s piece. Right now it’s at the “adding water to create shapes” stage but by tomorrow night, it’ll be completely dry and ready for me to start adding accents with paint and ink. I can’t wait. 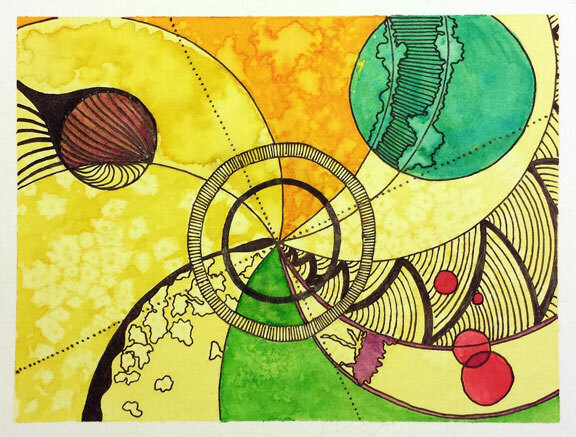 This entry was posted in Art and tagged 30-in-30, Abstract, Pen, Retro Circles, Watercolors on January 19, 2015 by Lori. Ah, unlucky number 13. Seems fitting for today’s piece. The informal theme I choose for this challenge was growth because I wanted to push myself into trying new things and yes, growing my skills somewhat. This is one of those “push it and see what happens” pieces and it’s just not working for me as a whole. There are things I like about it such as using the hard edge of a ruler to pull paint around rather than just using a brush. I’ll be exploring that again. I dug out some foam letters I’d bought at the dollar store once to try some printing but that part didn’t work as I would have liked. Still, it was fun to experiment with. I worked in layers, letting each one dry in-between although with gouache, that wasn’t as effective as it could have been. Still, I just fine it hard to create “pure” abstracts like this without any structure at all. I struggle with the results and don’t find them appealing to look at. Yet if someone else were to do something similar, I have no problems enjoying the artwork. Not sure why that is. Available for purchase, contact me at lahutton(@)gmail.com for details. 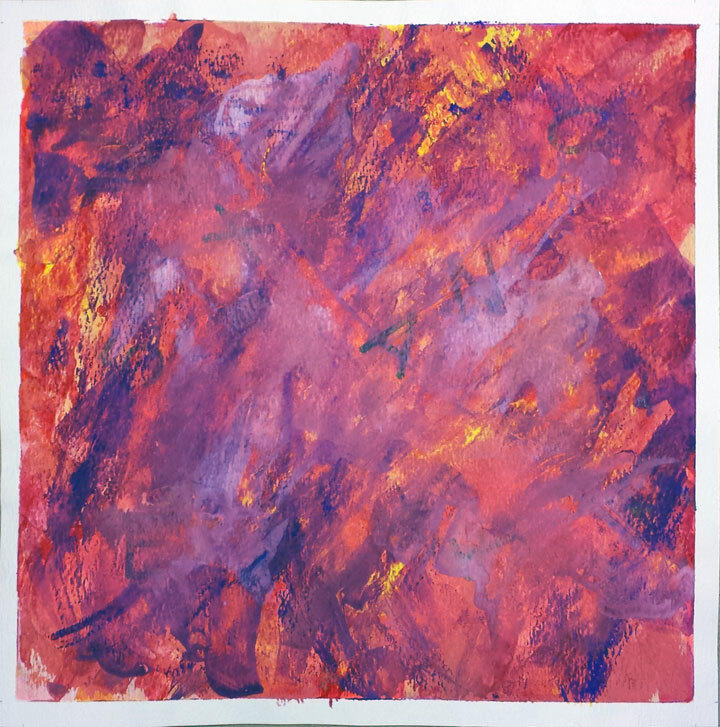 This entry was posted in Art and tagged 30-in-30, Abstract, Gouache, Pen on January 13, 2015 by Lori. Yes, we’ve reached one third of the way through Leslie Saeta’s 30-in-30 painting challenge. Yay! I’ve only completed 8/10 paintings but I’m still considering this a success so far. I’m trying some new things out for fun, playing around with techniques and styles, and overall enjoying myself quite a bit, and what is art for but to provide enjoyment? 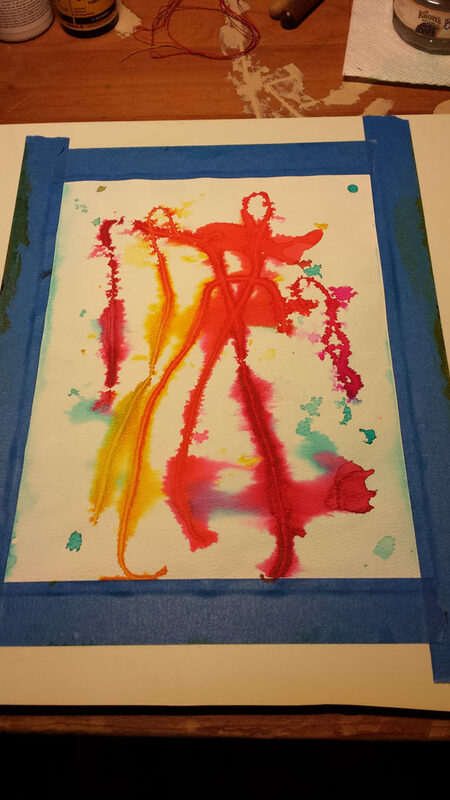 Today’s piece builds off of day 8’s “String Theory” (and I’ve imaginatively named this one “String Theory II”) by using threads soaked with colors to bleed onto the page. This time though, I didn’t create a full background but let the white of the page come through. That is also one of my weaknesses. Just as I have troubles with deep dark colors, I don’t allow the white/negative spaces to come through as much as I maybe should. The blue colors along the edges is a result of the tape I reused having some turquoise paint left on it and that bleeding out, which goes well with the rest of what I was doing. Available for purchase, contact me at lahutton(@)gmail.com for more information. 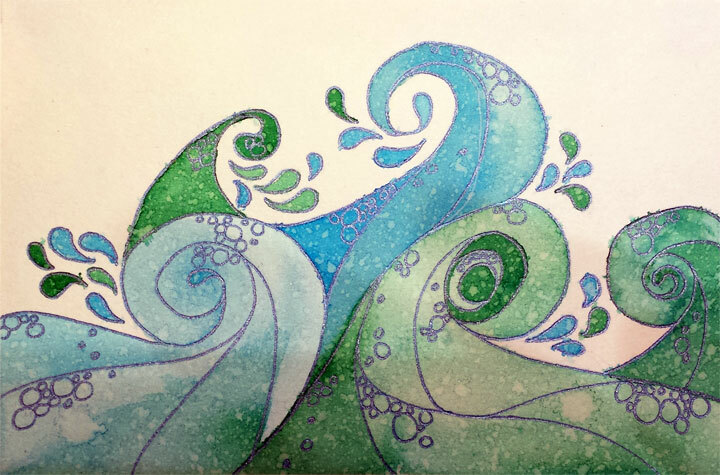 This entry was posted in Art and tagged 30-in-30, Abstract, Ink, Pen, Watercolors on January 10, 2015 by Lori.